In our quest to find the best Nova Scotia campgrounds, we spent seven weeks travelling and camping our way through this deceptively big province. We racked up thousands of kilometers on the road, to find as many awesome camping options as we could. In particular, we prioritised finding campgrounds that were tent friendly. Many ‘campgrounds’ these days look more like a parking lot, designed primarily to accommodate motorhomes. This is not the camping experience we look for. Indeed, we know many people feel the same. So while most of the recommendations on this list are still applicable to RV users, the campgrounds named here are highly rated for offering what we think as a traditional camping experience. 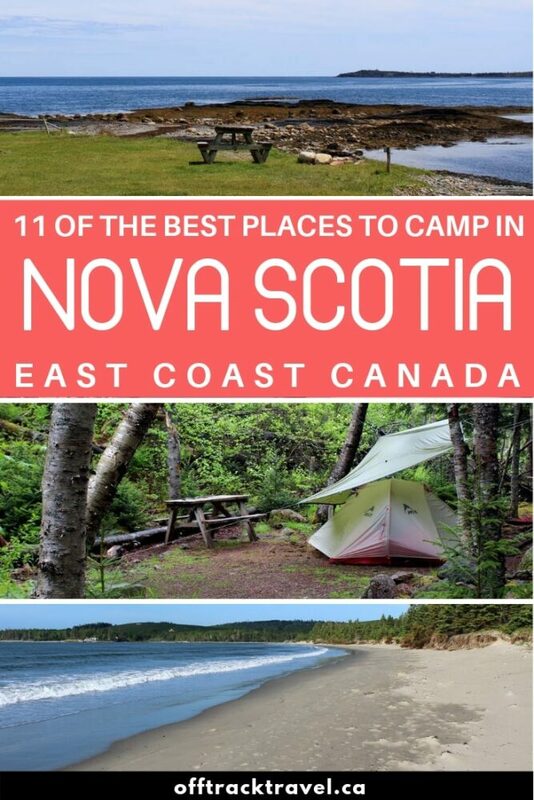 So without further ado, here are our top picks for the best Nova Scotia campgrounds plus all of the essential info you need to stay at each one. 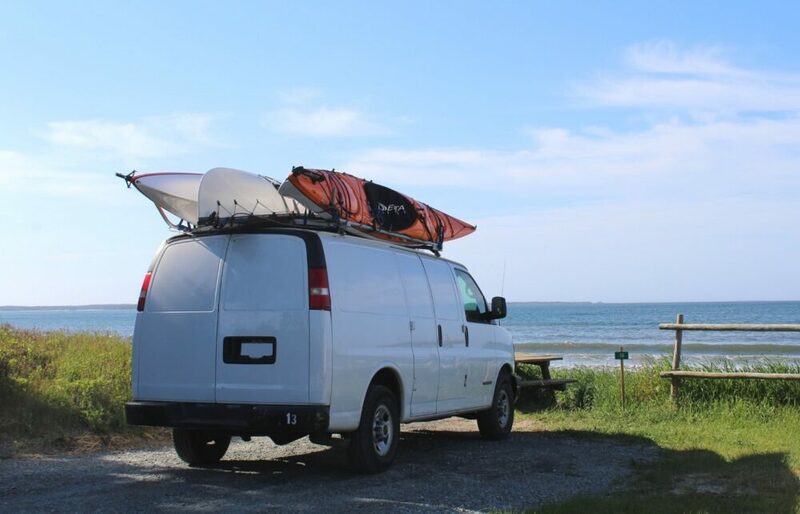 Starting first with vehicle accessible campgrounds, we believe the following to offer some of the best camping in Nova Scotia. 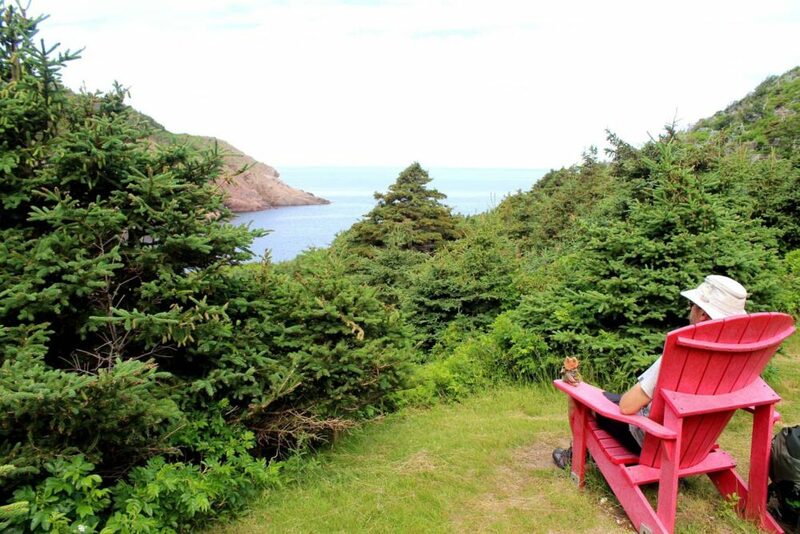 Perched on a rock high above the Atlantic looking out to the ocean and a pebble beach, Meat Cove Campground offers some of the best views on Cape Breton Island. A short hike behind the campground leads to an epic lookout point that feels like the end of the world. As wild and rugged as Meat Cove feels, it is actually remarkably accessible. A relatively short drive away from the Cabot Trail and a little adventurous spirit is all that is required. You won’t regret it – this small, relaxed campground is something special. The name of the area, in case you wondered, is believed to have come from the location once being a popular place to butcher animals. Don’t worry, Meat Cove is nothing but a peaceful, picturesque beach these days. 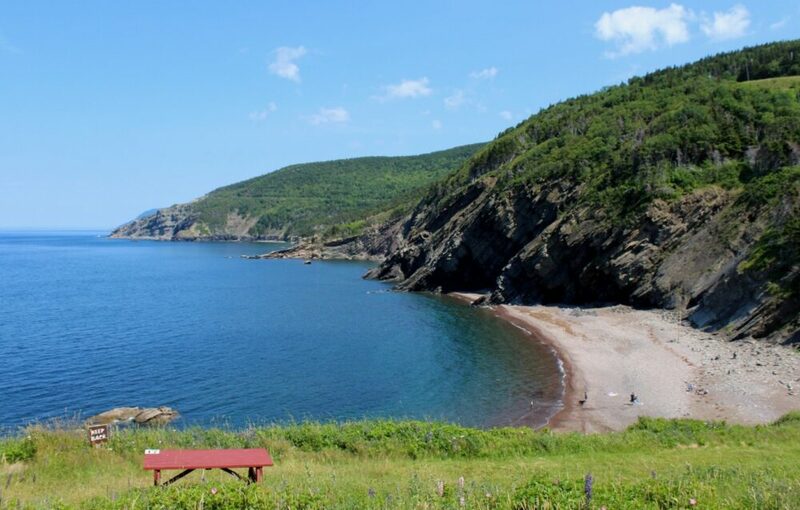 Directions: Meat Cove campground is located on the north coast of Cape Breton Island. It is accessed via a 35 minute (28km) drive from the Cabot Trail. Take the Bay St Lawrence Road turnoff at Cape North and continue 15km until you see a Co-Op store. Make a sharp left turn here onto Meat Cove Road and continue until the end. 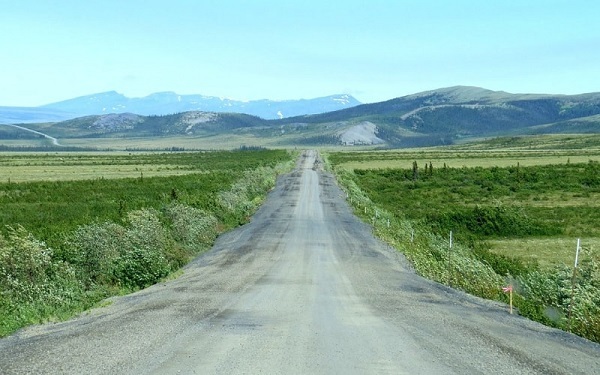 The last five kilometres of the road is gravel and also fairly narrow in places. 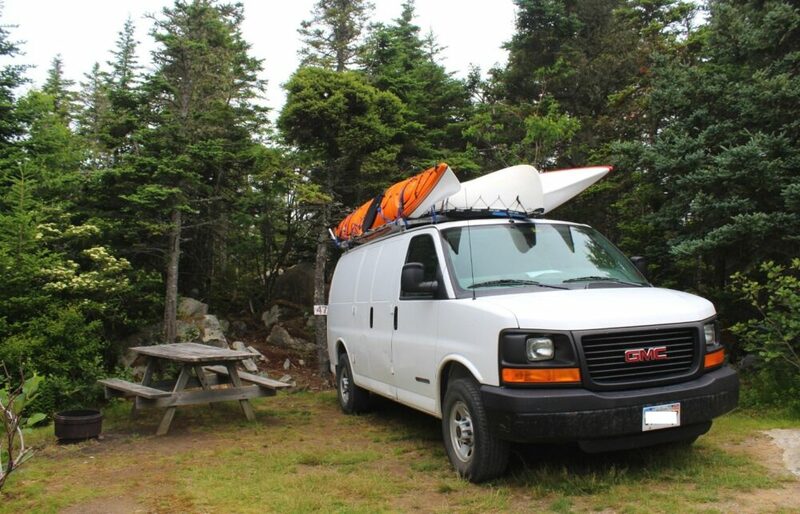 Price: Campsites at Meat Cove campground are $35/night, operated on a first come first serve system. We arrived early at around 12pm and had our pick of around a dozen spots. By 6pm, all the spots were taken. Good to know: The location and topography of Meat Cove means that this campground is suitable for tents, vans and small RVs only. The campsites are not as private as others mentioned here but the view more than makes up for it. Keep in mind that there are no fully sheltered sites at Meat Cove Campground. Camp where the mountains meet the sea in Cape Breton Highlands National Park. This park is a top destination for many travellers exploring Nova Scotia with a number of excellent Cabot Trail campgrounds. There are six vehicle accessible campgrounds of varying size and facilities – Broad Cove, Chéticamp, Ingonish Beach, Corney Brook, MacIntosh Brook and Big Intervale. Broad Cove is the largest with just over 200 campsites, some with services. One of the smallest campgrounds is Corney Brook. 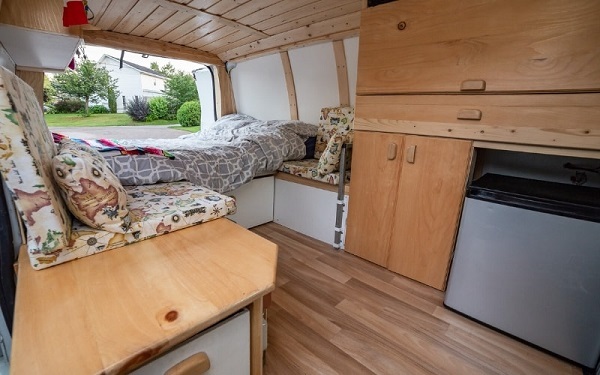 Located close to the ocean, Corney Brook offers a more rustic camping experience than the other vehicle accessible campgrounds in Cape Breton Highlands National Park. The views are, as you may expect, fabulous. 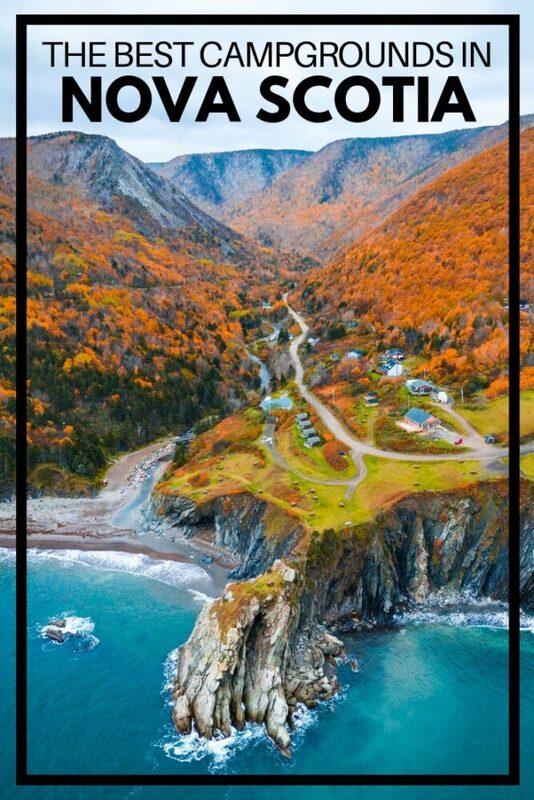 Directions: Cape Breton Highlands National Park is situated close to the top of Cape Breton Island in Nova Scotia. There are two main entrances to the park – Chéticamp and Ingonish. The Chéticamp entrance to Cape Breton Highlands National Park is a 4 and a half hour drive north from Halifax. Ingonish, on the park’s eastern side, is about 5 hours. Facilities: Having six different vehicle accessible campgrounds, the facilities vary in this national park. Most have flush toilets, fire pits, water, shelters, playgrounds, hiking trails. The larger campgrounds have limited wi-fi, playgrounds, serviced sites, free showers and interpretive programs for children. Price: Unserviced sites range from $17.60 to $27.40 per night while serviced sites are $29.40 to $38.20. Campers must also have a valid National Park entry pass (or annual Discovery Pass) which is $7.80 per person, per day. 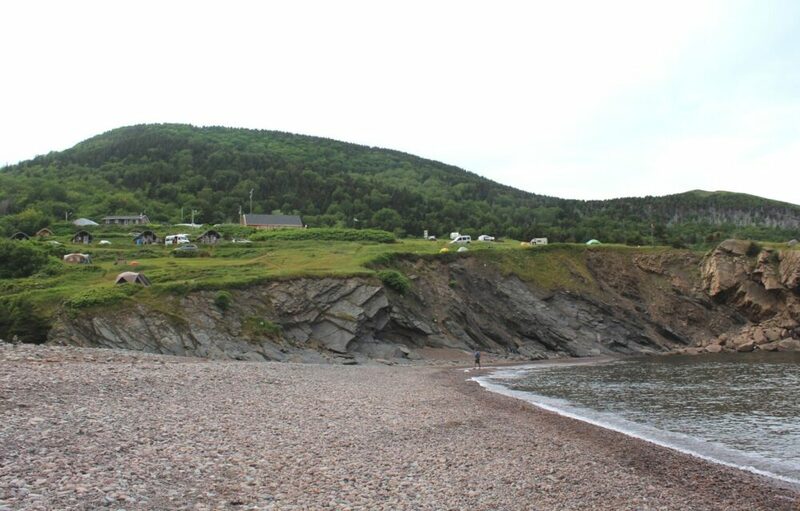 Campsites at Broad Cove, Chéticamp and Ingonish Beach can be reserved in advance on the Parks Canada website or by phone. The online reservation fee is $11. Good to know: Potable water is NOT available at Corney Brook campground so be sure to bring some with you. It is not often that a private campground will dedicate an oceanfront area to tent campers but that is exactly what Ovens Natural Park has done. The tenting area is well thought out too, using natural borders (trees, rocks) to separate the sites and create a sense of privacy. The panoramic ocean views aren’t the only reason to stay at Ovens Natural Park, as beautiful as they are. The range of on-site activities is also pretty convincing. 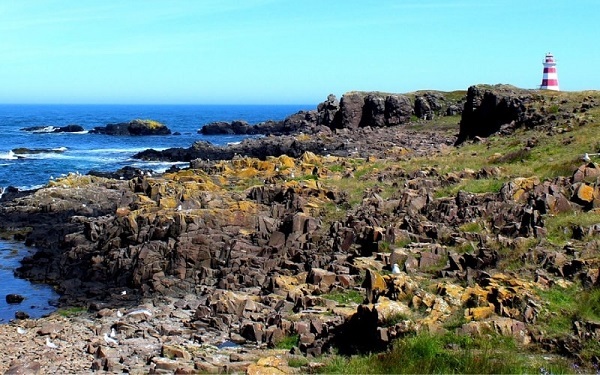 One of these is a 2km coastal trail allows visitors to safely explore the fascinating sea cave formations (or ‘ovens’) that give this park its name. The clifftop hike gives visitors a chance to descend and peer into these huge (and surprisingly colourful) caves. Directions: Ovens Natural Park campground is found 20 minutes (16km) south of Lunenberg, on Nova Scotia’s South Shore. Take Highway 332 towards Bayport and continue until Feltzen South Road turnoff (just after the Bayport Pub). Stay right at the divide a few kilometres later and you’ll find the Ovens campground at road’s end. Facilities: Free showers, water, flush toilets, fire pits, picnic tables, swimming pool, disposal station for RVs, small general store, museum, gold panning activities, sea caves trail. The on-site restaurant has live music six nights a week from late June to early September. 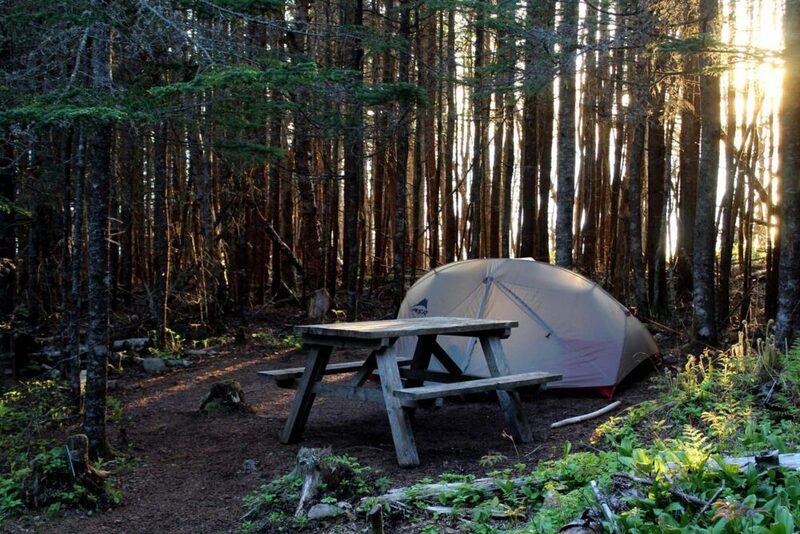 Price: Unserviced campsites at Ovens Natural Park are $35/night. Serviced sites start at $50/night. Cabins are also available for rent. It is possible to reserve camping and cabins via the Ovens website or by phone. Good to know: With day visitor rates being $10 per adult and $5 per child, overnight camping at the Ovens Natural Park proves to be good value for those wanting to hike the sea caves trail. 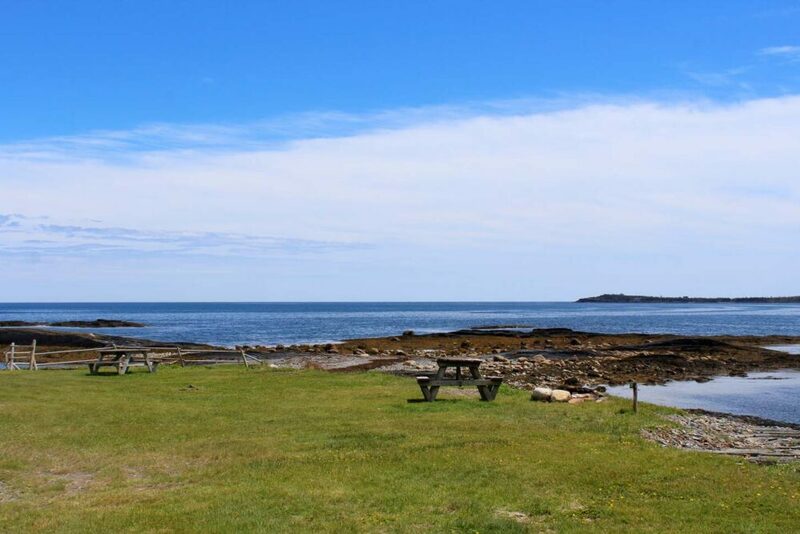 Rissers Beach is a picture perfect oceanfront campground on Nova Scotia’s popular South Shore, favoured by local and visiting families. The 1.5km long sheltered sandy beach is undoubtedly the biggest draw though the marshland boardwalk is also a contender. 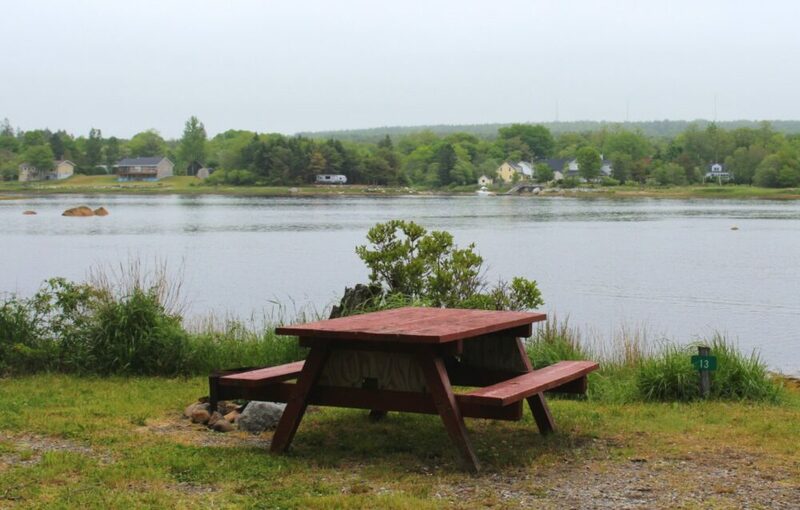 The campground itself is divided into two, with the larger side offering spots with unrestricted waterfront views. These campsites may lack in privacy (and shelter), but oh, that outlook is almost unbeatable. The other campsites are separated nicely, especially those in the forest just beyond Rissers Beach itself. Some of these spots still offer water views but have more shelter from both wind and sun. Directions: Rissers Beach is located in Petite Riviere on Nova Scotia’s South Shore, a 45 minute (44km) drive south of Lunenberg. The campground is accessed just off Highway 331. If approaching from the north, I’d highly recommend taking the ‘long’ way and via the cute LaHave ferry and excellent LaHave bakery. Facilities: Free showers, water, flush toilets, outhouses, changehouse, lifeguards, disposal station for RVs, ice firewood for sale, boardwalk trail, limited wi-fi. There are a handful of cafes and food take outs within five kilometres. Price: Unserviced and walk-in camping sites at Rissers Beach cost $26.70/night. Serviced sites are $35.60/night. Reservations are strongly recommended in the busy summer season and can be made online or by phone, starting in April. The nonrefundable online reservation fee is $9. Good to know: The campsites at Rissers Beach are separated into two campgrounds on either side of the highway. Little Rissers is located on the beach, with some waterfront campsites and others in the woods parallel to the ocean. 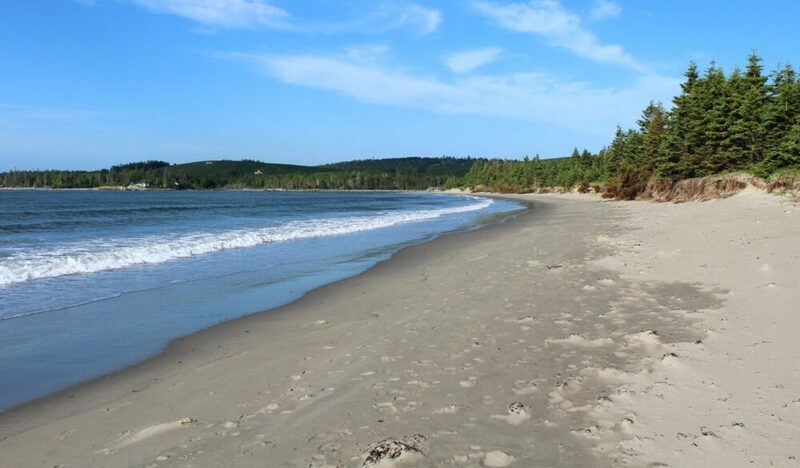 In an area with so many beautiful, pristine sandy beaches, Thomas Raddall Provincial Park is a welcome place to camp. Alongside access to such beaches, this park features hiking and cycling trails. Seals can sometimes be spotted (and heard) from the beaches. Thomas Raddall campground is particularly well known for space. Most campsites are fairly large and are located at a reasonable distance from other sites. 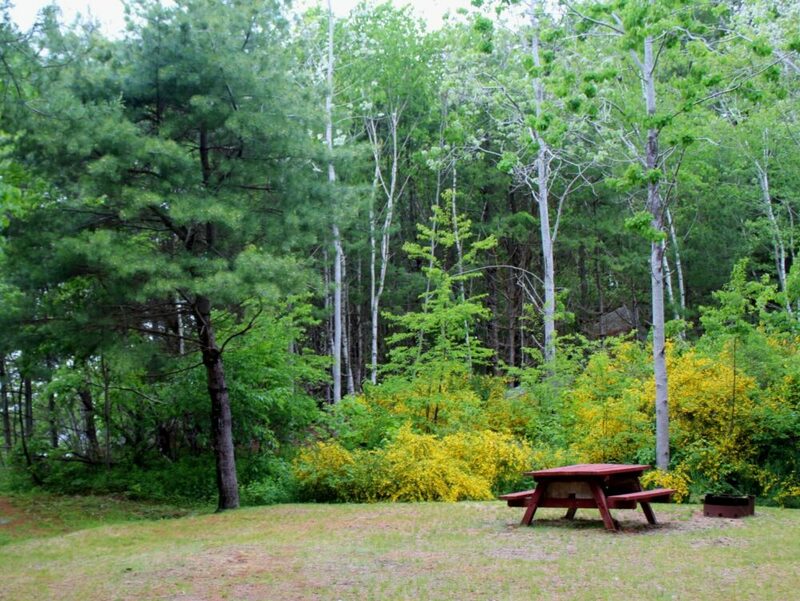 Surrounded by forest, campsites retain a good level of privacy. Directions: Thomas Raddall Provincial Park is located between Liverpool and Shelburne on Nova Scotia’s South Shore. From Highway 103, take exit 22 towards Port Joli. Continue and then turn left on Raddall Park Road. Thomas Raddall is a 2 hour drive from Halifax. Price: Unserviced and walk-in campsites at Thomas Raddall Provincial Park cost $26.70/night. There are no serviced sites at this campground. Reservations can be made online or by phone, starting in April. The nonrefundable online reservation fee is $9. Good to know: Other beaches in the area worth a stop at include Summerville, Carter’s Beach and Kejimkujik National Park Seaside. Just a short drive from the town of Shelburne is Islands Provincial Park, an ideal stopover campground when exploring the South Shore. Some of Shelburne’s most notable historic buildings can be seen across the water from a few different areas of the campground. The campsites themselves are a mixture of waterfront and forested, with the level of privacy varying quite widely between sites. The circular nature of the layout does help the campground feel more spacious. Some of the waterfront spots are really quite fabulous. Our favourite spots were undoubtedly sites 62 and 63, located in a more private area near the entrance. 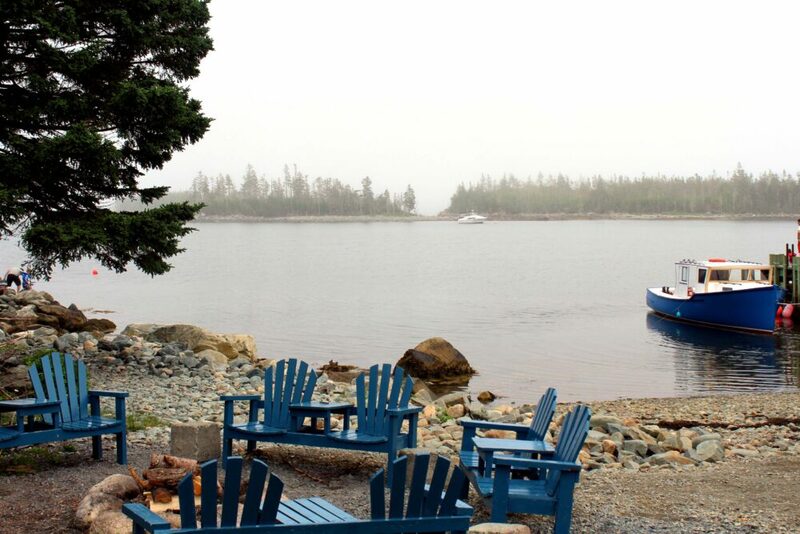 The water views make the area a very pretty spot and the direct access to the ocean would be a bonus for any kayakers. Directions: The Islands Provincial Park is a very short (4 minute) drive from the town of Shelburne on Nova Scotia’s South Shore. The campground is also very easily accessible from Highway 103 – take exit 26 towards Shelburne and then make a right onto Highway 3 (Lighthouse Route). The park is located on Island Park Road. Facilities: Free showers, water, flush toilets, fire pits, picnic tables, boat launch, outhouses, picnic shelter, disposal station for RVs, ice and firewood for sale, limited wi-fi (at administration building), beach. Price: Campsites at Islands Provincial Park cost $26.70/night. There are no serviced sites at this campground. Reservations can be made online or by phone, starting in April. The nonrefundable online reservation fee is $9. Good to know: Many of the campsites at Islands Provincial Park are sheltered by trees, providing some protection against sun and wind. Much quieter than its southern neighbour, Nova Scotia’s Eastern Shore is the place to go to enjoy unspoiled nature, outdoor adventure and a slower pace of vacation. 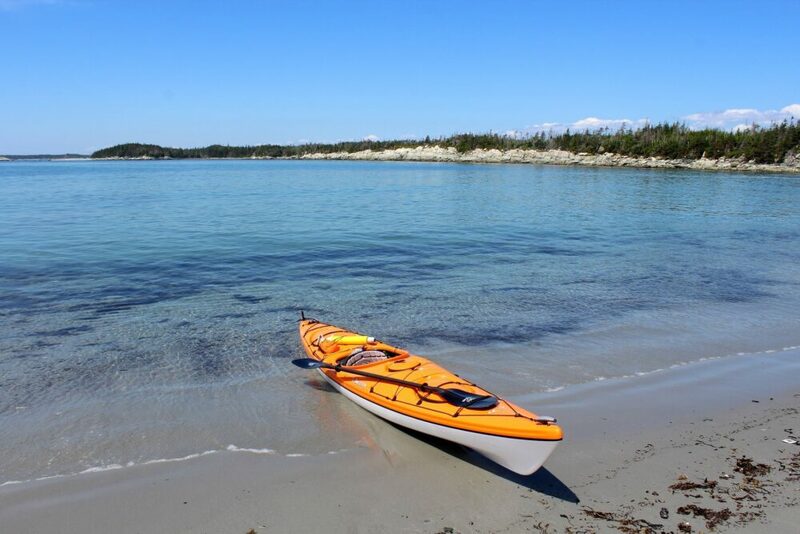 Murphy’s Camping on the Ocean is an ideal base to explore the area, especially if you like kayaking. It’s not just the oceanfront location that makes Murphy’s a special place to be. The owners are dedicated to providing above and beyond services to enhance your stay. There is a free mussel boil every night at the campfire plus canoe rentals and boat tours of the beautiful 100 Wild Islands area. The campground itself offers a mix of tent and serviced RV sites. My pick for tent campers looking for privacy would be sites 38 to 52. These look out to the ocean and are backed by forest, yet are located just a two minute walk from the rest of the campground. Directions: Murphy’s Camping on the Ocean is accessible via an easy 75 minute drive from Halifax on Highways 107 and 7. Before reaching the small community of Murphy’s Cove, turn right onto Murphy Road and follow to the end of the road. Facilities: Free showers, water, flush toilets, picnic tables, fire pits, communal fire pits, free morning coffee, boat launch, nightly mussel boil, vehicle parking (for kayak trips), disposal station for RVs, canoe/boat rentals, wi-fi, accommodation packages with local seafood. Price: Unserviced camping sites are $30/night. Serviced sites start at $40/night. There is a 15% discount for stays of 7 days or more. Reservations can be made by phone or via the Murphy’s Camping on the Ocean website contact form. 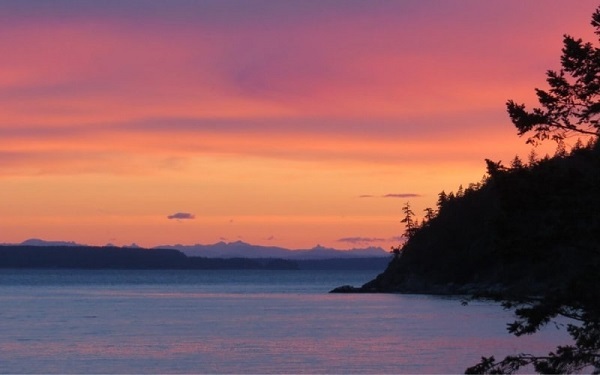 Good to know: For wilderness camping experience, it is possible to arrange a boat drop off and pick up in the 100 Wild Islands protected area through Murphy’s Camping on the Ocean. 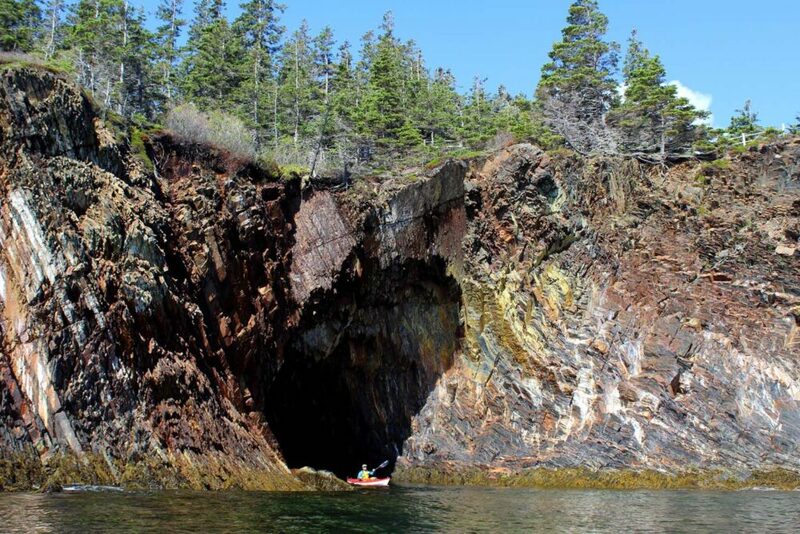 This is a great option for non-kayakers who want to explore beyond Nova Scotia’s mainland. 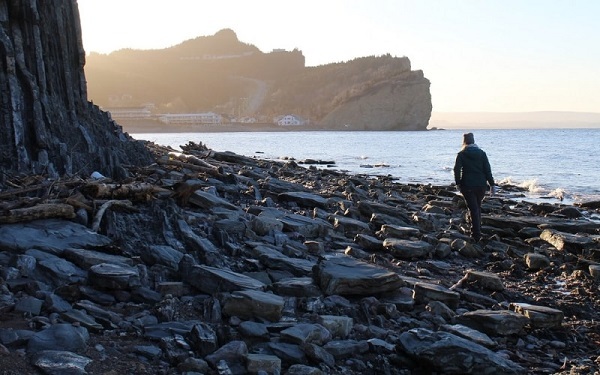 A great alternative to Cape Chignecto (mentioned below), Five Islands Provincial Park offers vehicle accessible camping along Nova Scotia’s Fundy Shore. Campers can hike, paddle, go clam digging or simply hunt for interesting rocks along the beach. 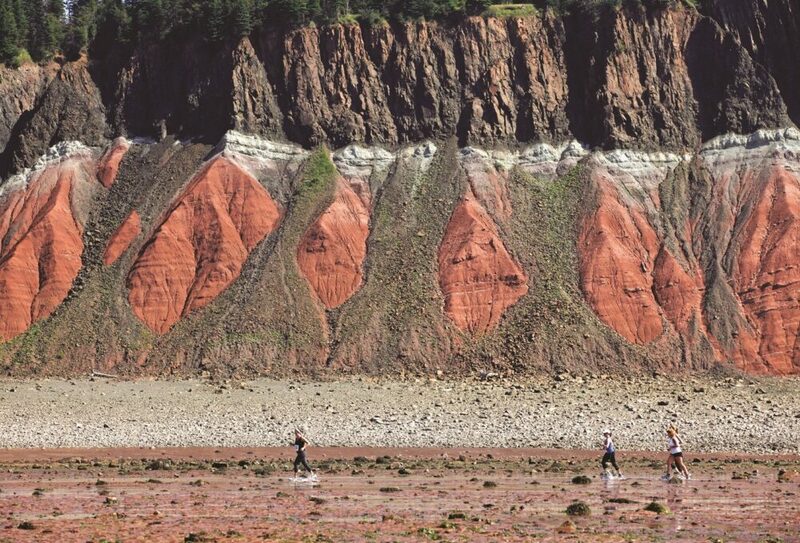 The pebbly beach in question is bordered by imposing 90 metre red cliffs that offer fantastic views of the world’s highest tides. Open from mid June to mid October, the Five Islands campground is split into two sections – A and B. The latter is aimed at tent campers, consisting of unserviced sites. 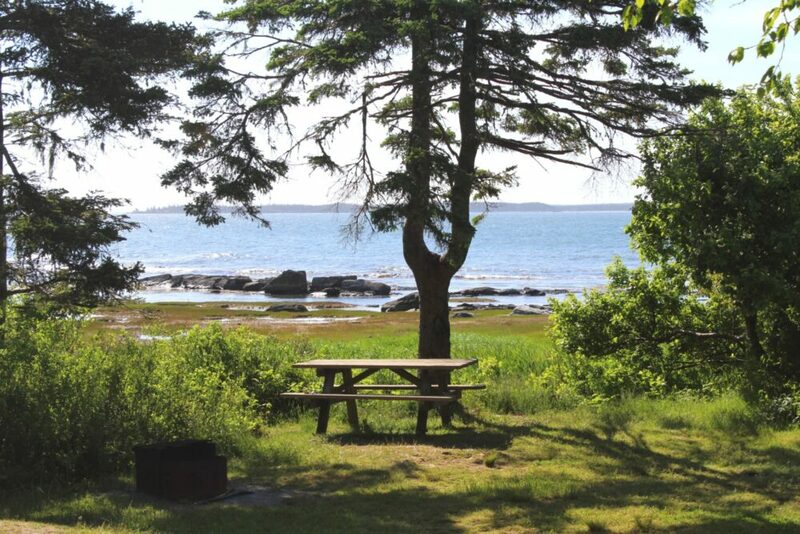 Unlike most campgrounds in Nova Scotia, Five Islands is quite open with few trees. The sites are still well spaced however. 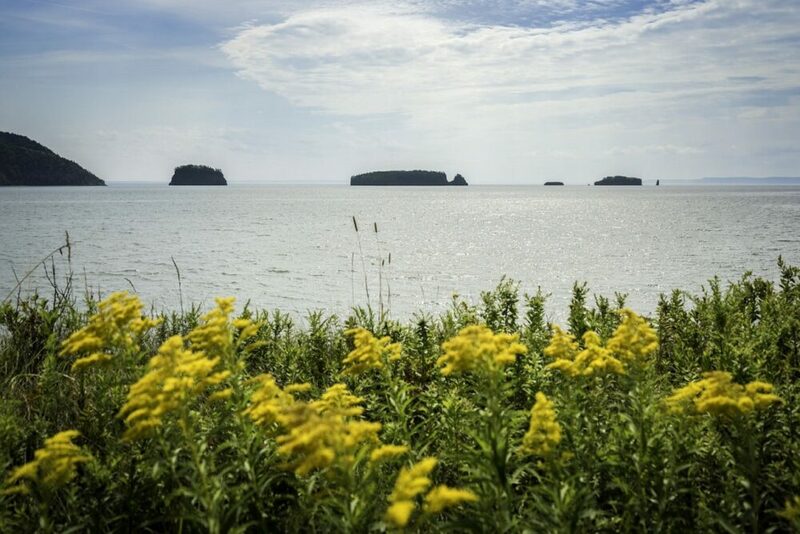 Directions: Five Islands Provincial Park is located just off Highway 2 along the Fundy Shore. Halifax is about an hour away by road, while Truro is an hour at the most. The park is well signed along the highway, just be sure to turn at Bentley Branch Road towards the coast. Price: Unserviced and walk-in campsites at this provincial park cost $26.70/night. Serviced sites are $35.60/night. Reservations can be made online or by phone, starting in April. The nonrefundable reservation fee is $9. Good to know: Beach users and paddlers should be careful to check tide times before heading out. The Fundy tides move quickly and have been known to catch people unaware. 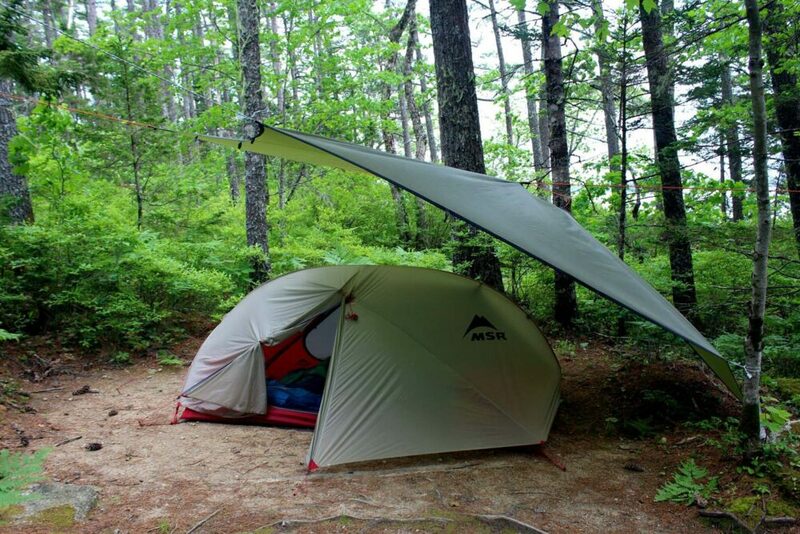 Tent campers with a sense of adventure should consider taking a trip to one of Nova Scotia’s wilderness campgrounds. All of the following campgrounds require a hike or paddle to reach. There are clear rewards however, especially if you like quiet, picturesque campsites with very few other people in sight. This is real, back to basics camping. Camping at Seal Cove on the Cape Chignecto Coastal Trail – definitely one of our favourite Nova Scotia campgrounds. The sunsets seen from here were fabulous! 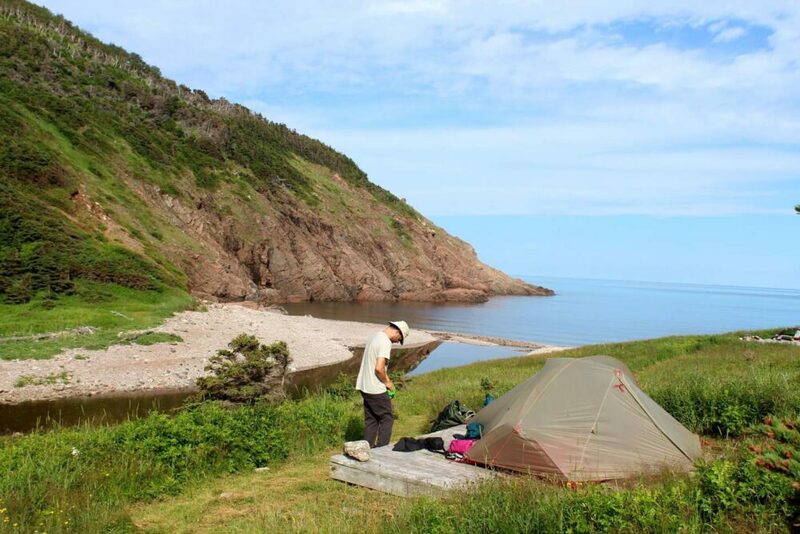 For tent campers with a sense of adventure, Cape Chignecto offers fantastic walk-in camping opportunities. Cape Chignecto Provincial Park has over 65 tent only campsites distributed between 9 unique campgrounds. 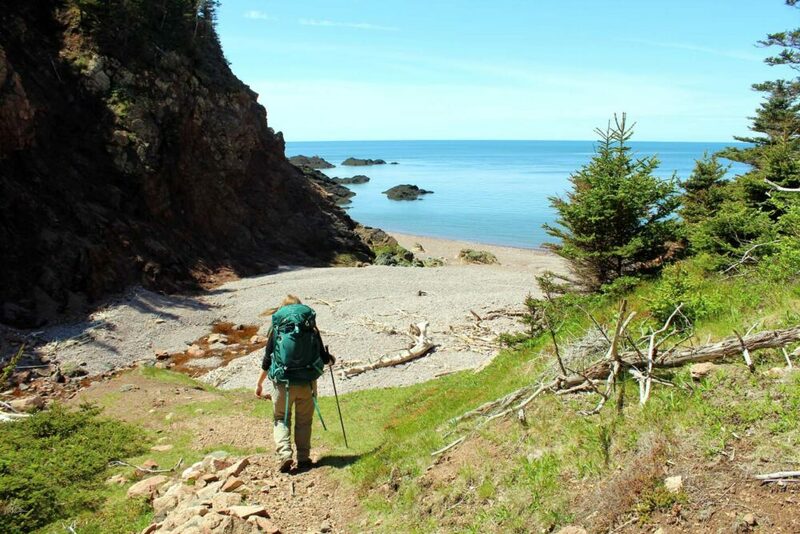 Seven of these campgrounds are located on the Cape Chignecto Coastal Trail, a 52km hike around the rugged Fundy coastline. The trail is a fantastic 3-4 day hike of moderate difficulty. Seal Cove campground was a particular highlight during our own hike. Christy Field and New Yarmouth campgrounds are located close to the main Cape Chignecto parking lot and offer 34 walk-in campsites. Directions: This wilderness park is located on the Bay of Fundy, with the main entrance being just slightly west of the community of Advocate Harbour. Cape Chignecto Provincial Park is a 2 hour drive from Truro, or 3 hours from Halifax. Once in Advocate Harbour, turn off the Highway 209 onto West Advocate Road and follow to the end. Facilities: Cape Chignecto’s walk-in campgrounds have designated campsites and outhouses. 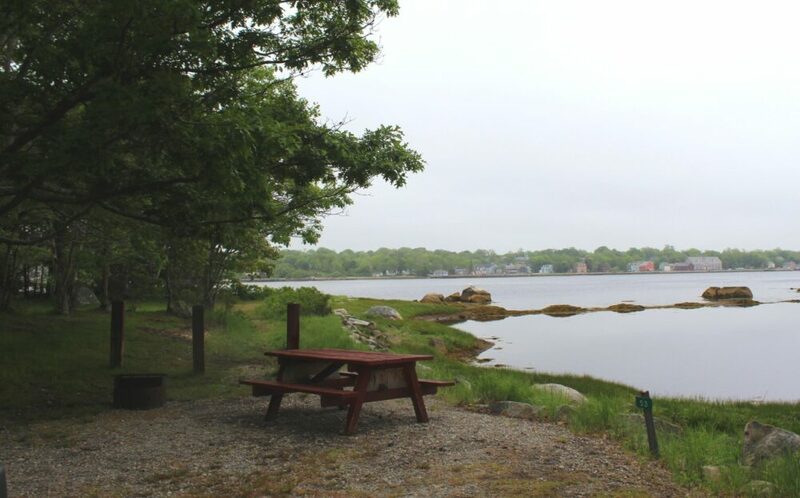 New Yarmouth campground has water, individual fire grills and a woodshed. Campers should be self sufficient. The vast majority of sites are sheltered and surrounded by forest. Price: The unserviced walk-in campsites in this park cost $26.70/night. Reservations are possible by phone or through the Nova Scotia Parks website. Four cabins located along the Cape Chignecto Coastal Trail are also available to rent. Good to know: Phone signal is spotty in Cape Chignecto Provincial Park. Hikers attempting the Cape Chignecto Coastal Trail should be completely self sufficient and carry a filter to treat water along the route. 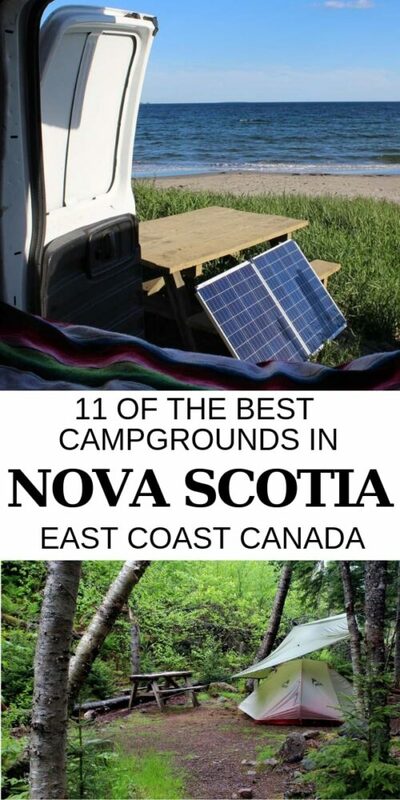 Almost all of what I consider to be the best campgrounds in Nova Scotia are found on the coast. 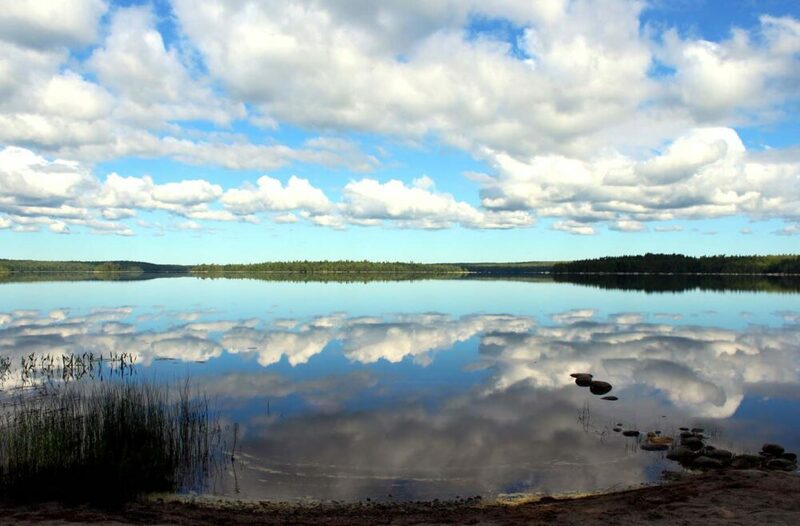 Kejimkujik National Park is the exception, offering 47 wilderness campsites within inland southern Nova Scotia. Kejimkujik’s backcountry campsites are only accessible via hiking trails and canoe routes. The latter is undoubtedly the most popular way to explore this park, which is dotted with intricate lakes. Canoe routes in Kejimkujik are custom made, with paddlers having the choice of length, distance and wilderness level. Once a backcountry campsite has been allocated at Kejimkujik, the permit holders have exclusive use of that campsite. With no sharing required, camping in Kejimkujik offers the ultimate in privacy. 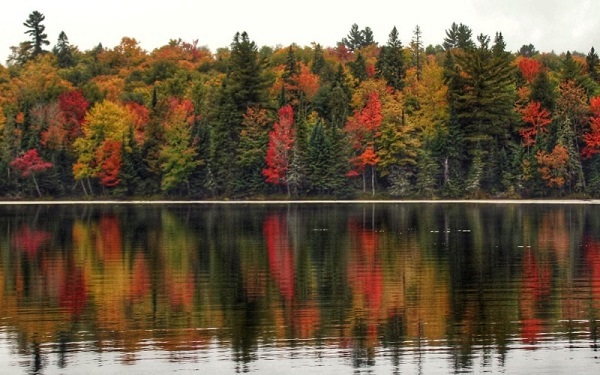 Directions: Kejimkujik National Park is a 2 hour drive from Halifax, mainly on Highway 103. Take Exit 13 onto Highway 325 and continue onto the 208. 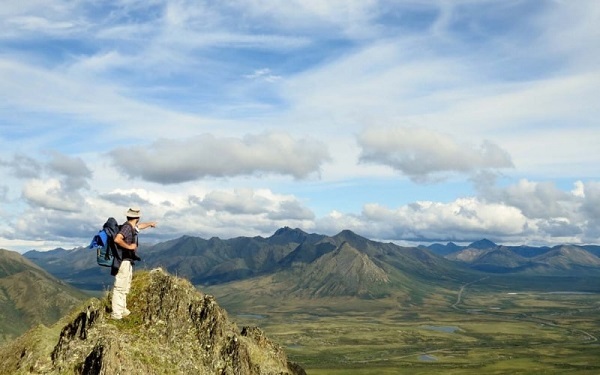 At Caledonia, head further inland on Highway 8 and follow the signs to the National Park. There are several different canoe launches in the park but your first stop should be the Visitor Centre. Facilities: The wilderness campsites in Kejimkujik have cleared spaces for at least two tents, an outhouse, picnic table, bear cables for food storage and firebox for campfires. Firewood is left at the site or available from a central pick-up point (map will be given at the Visitor Centre). Four sites do not have a firebox or firewood. Price: Campsites cost $24.50/night per camping party in Kejimkujik. Campers must also have a valid National Park entry pass (or annual Discovery Pass) which is $7.80 per person, per day. Reservations are recommended for the summer months and can be made online at the Parks Canada website or by phone. The online reservation fee is $11. 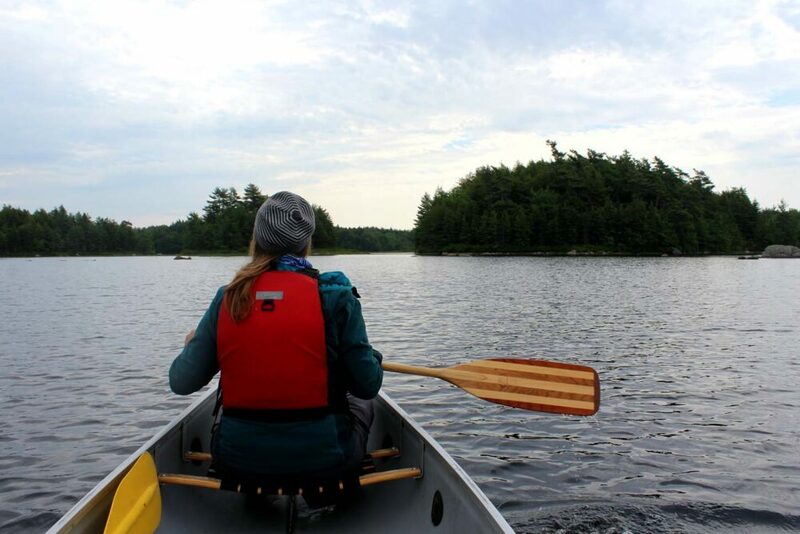 Good to know: In addition to the camping sites, there are wilderness cabins available to rent in Kejimkujik These are only accessible via canoe or foot. Jeremy’s Bay Campground offers vehicle accessible camping with hundreds of sites, showers and flush washrooms. Wilderness camping is quite limited in Cape Breton Highlands National Park. 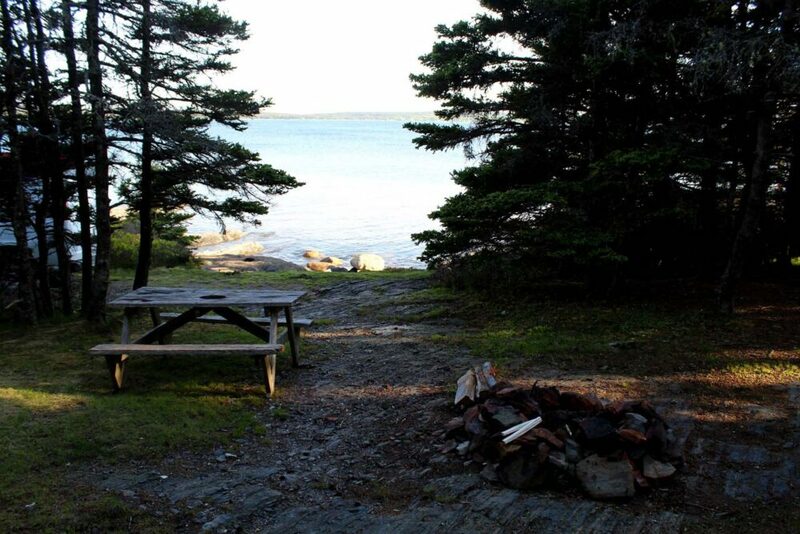 In fact, there is only one established backcountry campground – Fishing Cove. This pretty waterfront spot has eight spots for tent campers looking to explore beyond the Cabot Trail. The Fishing Cove backcountry campground is only accessible via a 6km trail. The hike is reasonably easy, with the main challenge being an initial 355m descent (and ascent on the way home). At the end, you’ll find a spacious campground with eight tent pads, each offering direct ocean views. Being west facing, Fishing Cove is the perfect place to watch the sunset. A short trail leads down from the campground to a pebble beach. The isolated location of Fishing Cove makes for a very quiet and peaceful night under the stars. Directions: The Fishing Cove trailhead is found just off the Cabot Trail, 24km north of the Chéticamp Parks Canada Visitor Centre on Cape Breton Island. 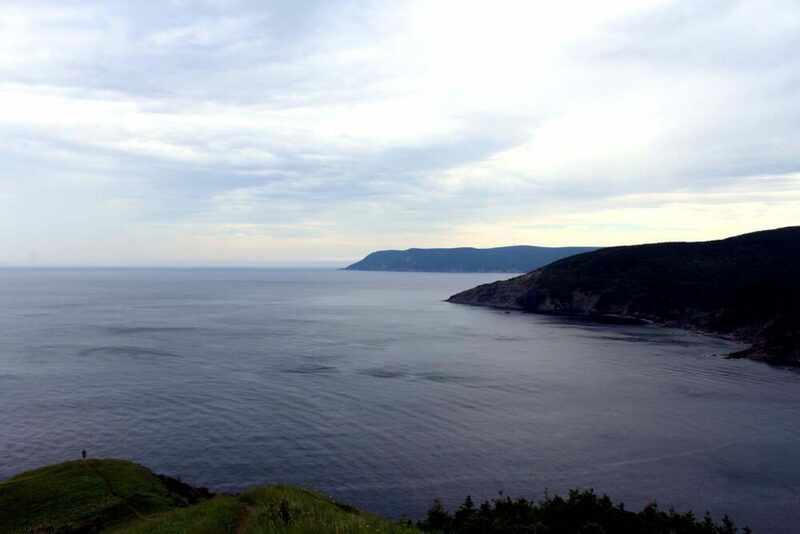 Ingonish, at the other end of Cape Breton Highlands National Park, is 83km away. The trailhead for this Cabot Trail campground is well signed from the main road. Facilities: Wooden tent pads, outhouse, bear hang, two Parks Canada Adirondack chairs. Campfires are not allowed at Fishing Cove. The tent pads are situated some distance from each other, allowing for some privacy. 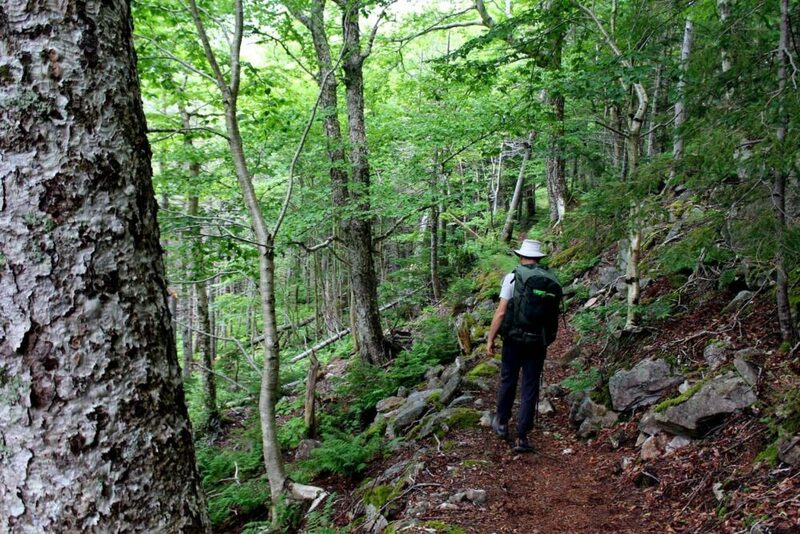 Price: The backcountry camping fees in Cape Breton Highlands National Park are $9.80 per person, per night. Campers must also have a valid National Park entry pass (or annual Discovery Pass) which is $7.80 per person, per day. 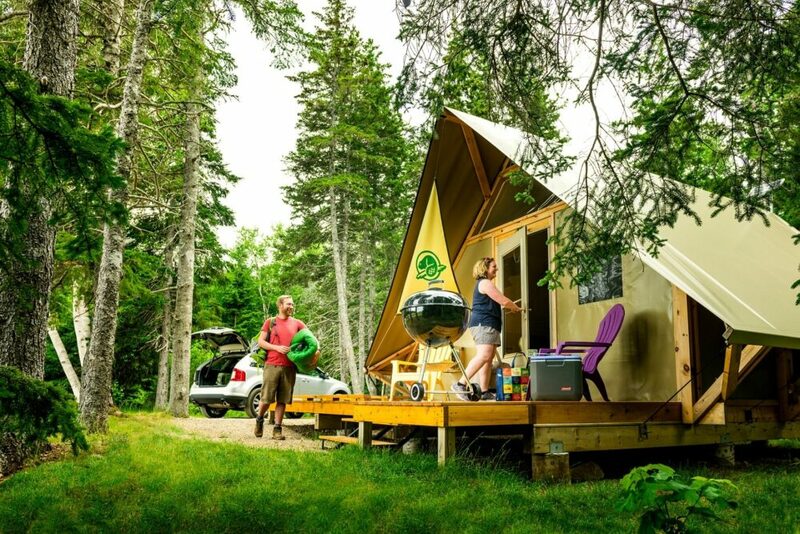 Campers can reserve sites online, by phone or a few days in advance at the Parks Canada Visitor Centres in Cape Breton Highlands National Park. The latter option is free. Good to know: Moose are commonly seen in the Cabot Trail area. Bears and coyotes also present in this region.Be sure to stay alert, make noise and do not approach wildlife. Use the bear poles next to the Fishing Cove outhouse to store food properly. 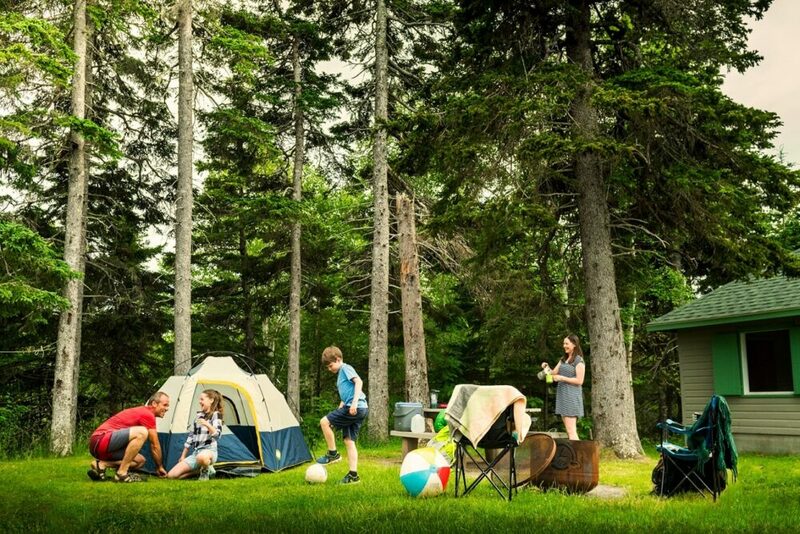 What are your favourite Nova Scotia campgrounds? Let me know in the comments below! If you found this post helpful, PIN or save it for future reference with one of the above images! I love this article. We are always looking for tent sites for our family of 5. I have to agree that many campgrounds look like parking lots and it’s hard to find. I have travelled to Nova Scotia twice on camping trips (from Ontario) and have stayed at two of the sites you have here – The Ovens a couple years ago and Meat Cove about 15 years ago. Both amazing places and glad to see them listed here. I’m glad you also liked staying at the Ovens and Meat Cove! Good tent campgrounds are definitely harder to find in Canada; I hope this article will be helpful if you return to Nova Scotia soon!